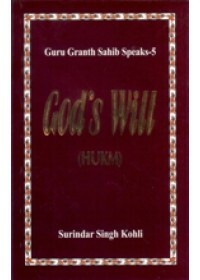 This short treatise on God's Will (Hukm) is the fifth paper-back volume in the series entitled GURU GRANTH SAHIB SPEAKS. The earlier four volumes in the series has been published under the title Ritualism and its Rejection in Sikhism. This series of books was launched in 1999 particularly for the Sikhs, who have settled abroad and have been living there for the past several generations. For this reason, they and their families are far removed from their own language and religious centres and in their busy life and engagements they are lacking in their spiritual and most essential food. In order to apprise them and their children, who are mostly ignorant about their great spiritual heritage, these books will create in them a greater understanding of their own religion. I am confident that they will be benefitted by these handy volumes. I have divided the present work into three parts. 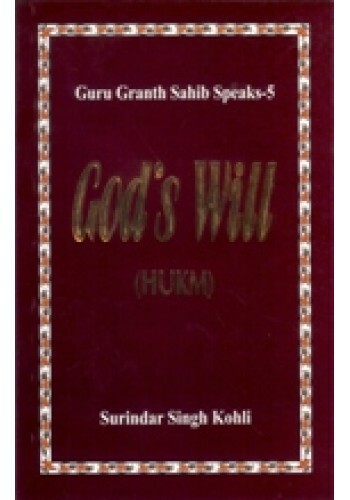 In the first part a short introduction is given about the concept of God's Will (Hukm). 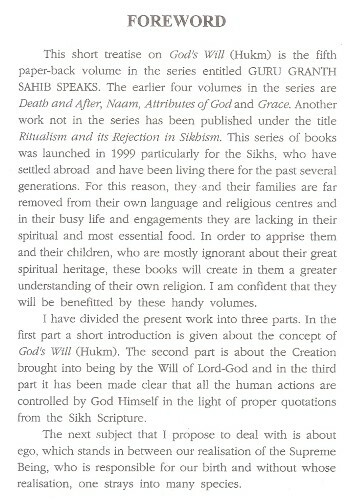 The second part is about the Creation brought into being by the Will of Lord-God and in the third part it has been made clear that all the human actions are controlled by God Himself in the light of proper quotations from the Sikh Scripture. The next subject that I propose to deal with is about ego, which stands in between our realisation of the Supreme Being, Who is responsible for our birth and without whose realisation, one strays into many species. 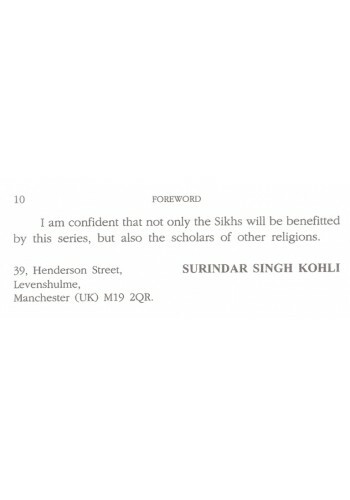 I am confident that not only the Sikhs will be benefitted by this series, but also the scholars of other religions.